Robert Aldrich was born one hundred years ago today and we classic movie fans are all the richer for it! Lee Marvin Point Bank readers are familiar with Marvin’s and Aldrich’s working relationship as they made a great film together in almost every decade of Marvin’s career: Attack!, 1956; The Dirty Dozen,1967; Emperor of the North, 1973. In fact, it was almost more than that as Marvin wanted Aldrich to direct Death Hunt (1983), which would have completed the last decade of Marvin’s career. (L-R) Director Robert Aldrich and costars Lee Marvin & Ernest Borgnine at the initial script conference for THE DIRTY DOZEN. Probably the most remembered of both of their careers was indeed The Dirty Dozen. The success of that film catapulted both the actor and the director to rarified heights of fame and success. 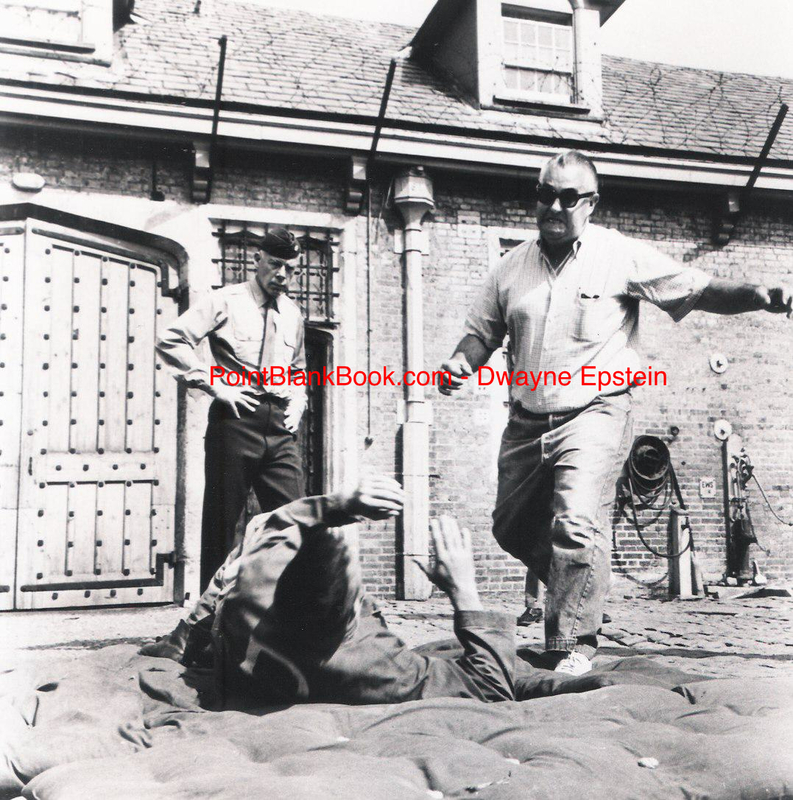 Aldrich demonstrates to Lee Marvin how to kick John Cassavetes in THE DIRTY DOZEN. Marvin got a million dollar paycheck from then on and was a top ten box office sensation for the next decade. Aldrich continued to direct & produce films that may have defied description, but maintained his high level of quality. His signature style, which included a love of characters bordering on the grotesque (Whatever to Baby Jane?, The Grissom Gang, The Choir Boys) and a distinct brilliance at mounting suspense through editing and character anticipation, put him in league with some of the greatest directors of all time. Case in point: The powerful climax to one of my favorites of his, Flight of the Phoenix, compares perfectly to the scene in which Lee Marvin goads Clint Walker into a knife fight in The Dirty Dozen. Watch the way Aldrich mounts the suspense in Phoenix by building to quicker cuts, showing the stranded characters’ apprehension in hopes of the resurrected airplane’s ability to start up just one more time. Rosaries are prayed on, sweat builds on the nearly dehydrated men, some of whom begin to jump up and down as the audience’s anticipation reaches a pitch. In Dozen, he does the same with mounting edits, sidelong characters laughing and goading the giant Walker to stab Marvin, as M.P. Richard Jaeckel is shown reaching for his sidearm. Both scenes are signatories of Aldrich’s unique style of cinema and it’s a style that is sorely missed in this day of computerized technology. 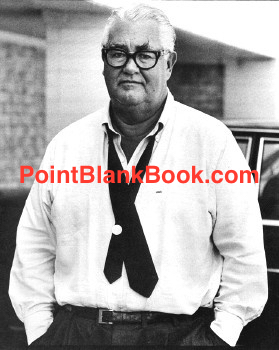 Robert Aldrich: August 9th, 1918 – December 5th, 1983. I think that’s something we could all use now. I was not planning on writing up this blog entry but after reading a Clint Walker obituary just now, I was compelled to do so. I’m not positive but I’m pretty sure I got the last interview with ‘The Big Fella’ for a recent issue of Filmfax Magazine. It came out earlier this year and by all accounts, seemed to be a popular read. On a personal note, it was actually the third time I had interviewed the man. The first time was for his work with Lee Marvin in The Dirty Dozen for Lee Marvin Point Blank and his insights were eye-opening and hysterical. Next, I spoke with him on his work with Charles Bronson on the same film as well as the strange 1970s western/fantasy White Buffalo. This time around it was much more intimate since the purpose of the interview was focused on HIS career and his career alone. When the official interview was over, we chatted like old friends and he could not have been nicer and more effusive on a one-on-one basis. He asked me about my career, my girlfriend Barbara, we laughed about small similarities in our lives and shared a true bonding over the telephone line. I know he wasn’t in the best of health at the time (he took a tumble down the stairs, recently) but we wished each other both lots of luck for the future year ahead. And now, just days before his 91st birthday, he has relinquished his mortal coil. I was more than lucky to know him, thanks largely to the amazing help of Deb, Elsie, I was honored. It’s cliche but in truth, we shall never see his like again. Read below our conversation and see for yourself. Farewell ‘Big Fella.’ You will be missed. 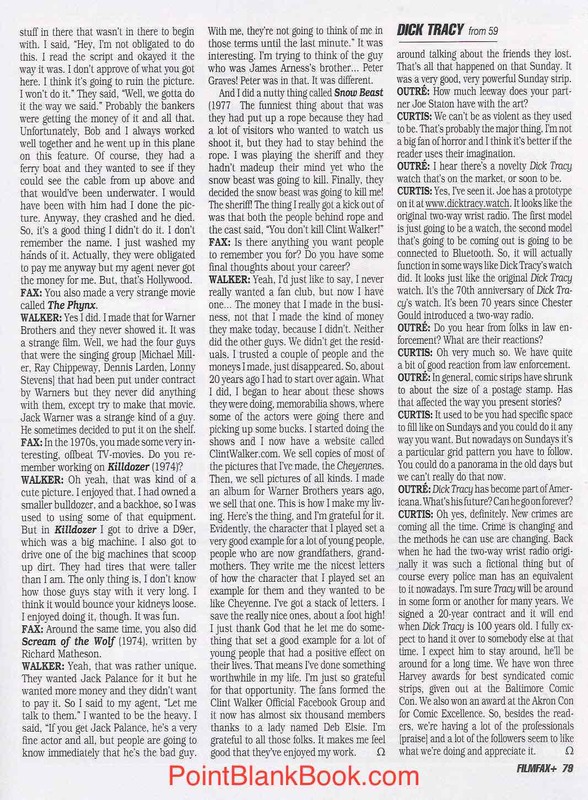 Page 2 of Clint Walker FIlmfax interview. 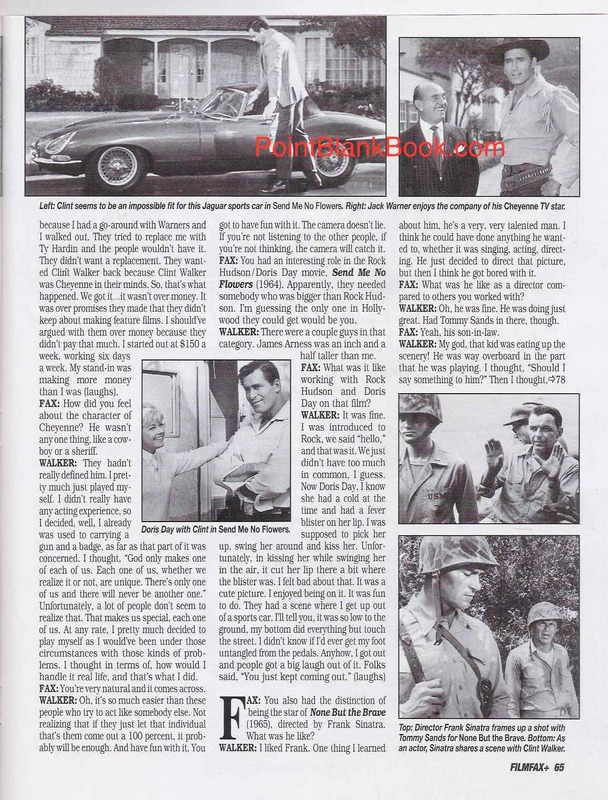 Page 3 of Filmfax Clint Walker interview. 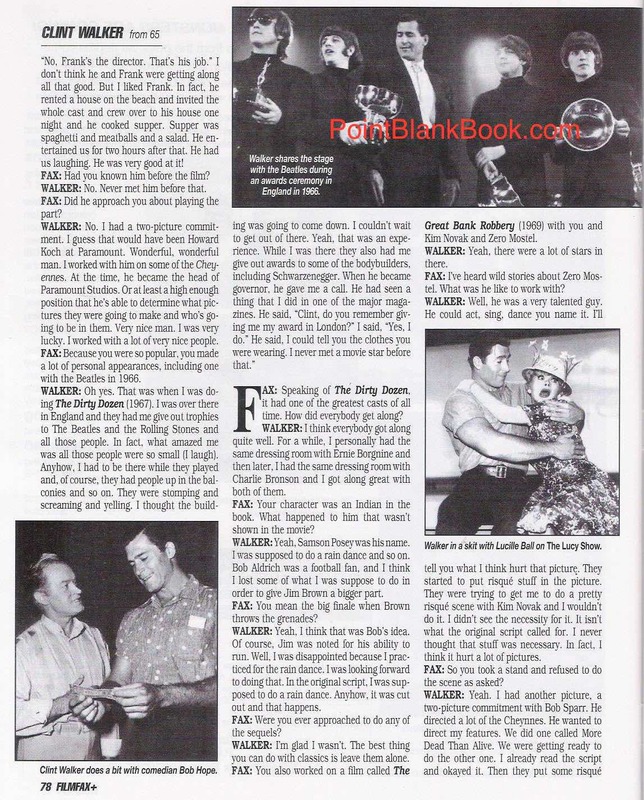 Page 4 of Clint Walker Filmfax interview. Page 5 of Clint Walker Filmfax interview. 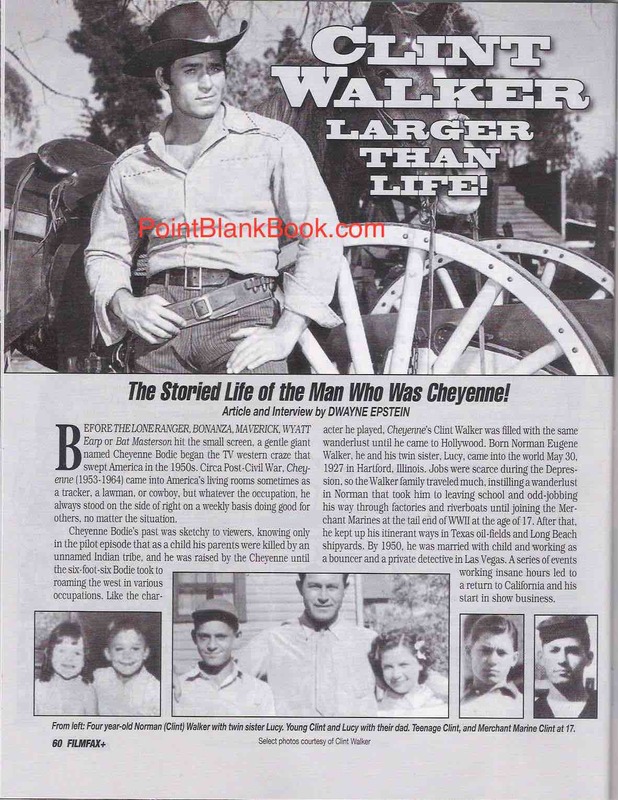 Page 6 of Clint Walker Filmfax interview. 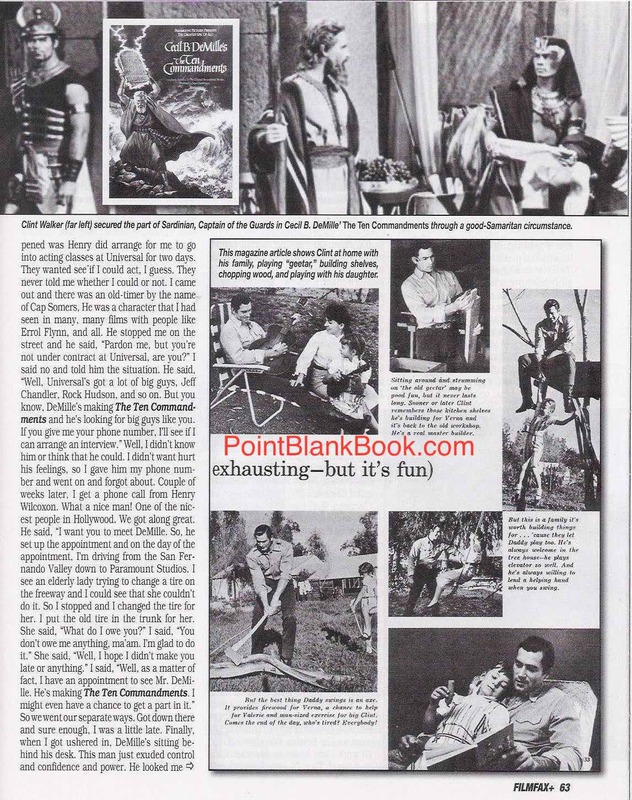 Clint Walker Filmfax interview, Page 7. 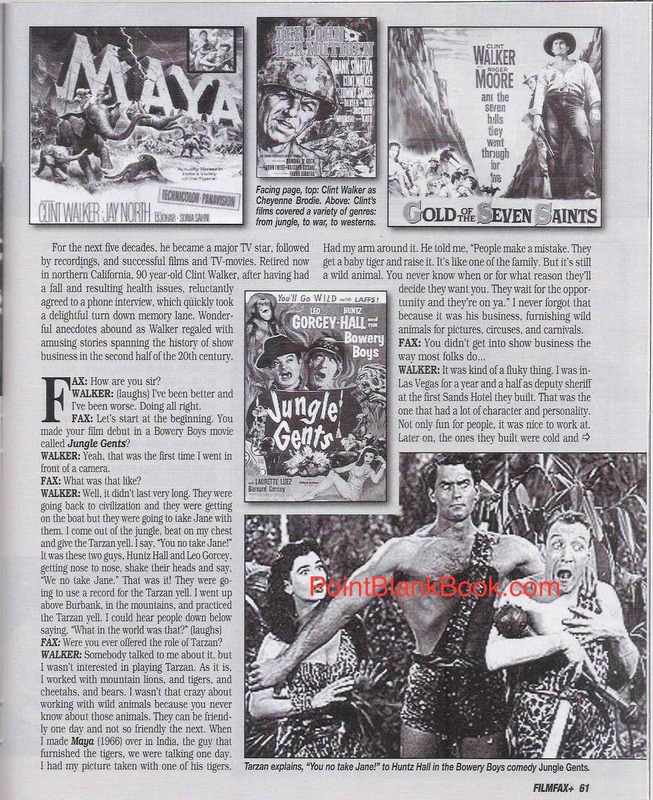 Clint Walker Filmfax interview, Page 8. STARTING THE NEW YEAR OFF W/ A GIG: CLINT WALKER! Happy new year faithful Lee Marvin Point Blank blog readers, and for yours truly, there’s no better way to start the new year than with a a new gig interviewing TV and movie legend Clint Walker! It proved to be another example of my Lee Marvin research turning into something more fortuitous. The background story is rather interesting. I had interviewed the big fella back in the early days of my work on the book as he costarred with Marvin in The Dirty Dozen. Unfortunately, not all that great stories he related made the book, but hey, that’s where blogs come in handy. I had then gotten back in touch with him fairly recently in hopes of getting his thoughts on working with Charles Bronson in The Dirty Dozen and then later in Bronson’s strange western/fantasy film, White Buffalo. As for the Bronson project, as Johnny Carson used to say, more to come. 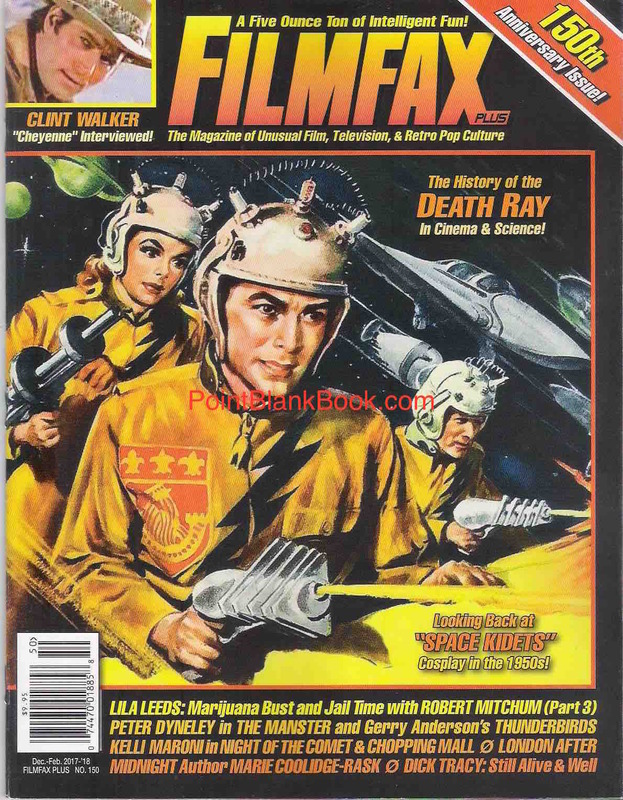 Filmfax cover for issue #150. My interview with Clint Walker even made the cover. Seriously. Well, look a little a closer in the top left corner there. Here, let me help…..
Top banner of FIlmfax, Dec.-Feb. 2018. There, that’s better. Anyway, the interview indeed went well as Walker eventually opened up to talk about his many decades in the industry. I got him to tell great tales on such luminaries as Jack Warner, Cecil B. DeMille, Doris Day, The Bowery Boys, Kim Novak, Frank Sinatra, Arnold Schwarzenegger, even The Beatles! It’s the reason I love what I do. I’m not going to post the article here, as it’s available in bookstores and newsstands everywhere. However, I can tease you a little to go out and buy a copy with this first page of the 8-page article…. Page 1 of my Filmfax interview with Clint Walker. If this teaser does want to make you go out and buy a copy of the magazine that publisher Mike Stein calls, “A five-ounce ton of intelligent fun,” then I humbly thank you. Re: Edits 1320 Oakton St.
Of course, if you didn’t care for the article, let’s just keep that to ourselves, shall we? I thank you and here’s to a happy and prosperous 2018! !